When you’re eating gluten free, snacks and quick meals can be hard to come by. This versatile recipe makes 15 chewy take-a-long bars that taste great and are stuffed full of good things. Optional: added flavour boosters such as 1 tablespoon frozen orange juice concentrate, 1 tablespoon maple syrup, pinch of cinnamon, or 1 teaspoon vanilla. Like this? You might also like geoff’s favorite oatmeal cookies or gf and me’s fruit filled oatmeal muffins. If it’s coconut you’re after, try our double coconut delight! 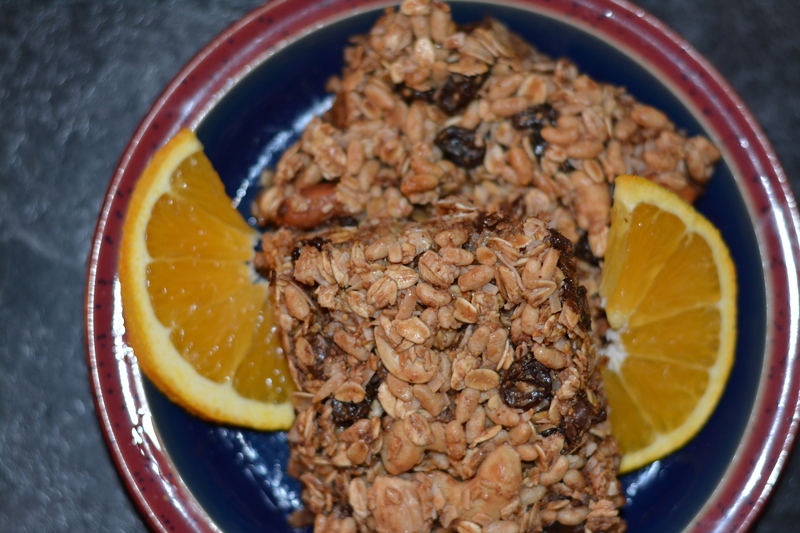 This entry was posted in Baking, Breakfast & Brunch, Recipes and tagged bar cookies, breakfast bar, GF, gluten free granola bars, gluten free in Red Deer, gluten free snack, granola bar, lunch bar, oatmeal bar, oatmeal cookies. Bookmark the permalink. Oh these look fantastic! I don’t have celiac disease but am trying to mostly eat gluten free for other health reasons, and you’re so right… snacks are so much harder to come by when you’re staying away from gluten (and refined sugar). I’ll definitely be giving these a try, with a couple of substitutions. Have you ever tried coconut milk or cream in place of the condensed? I’m kind of a coconut fiend, and am wondering if it would affect the texture much. It takes a bit of time, but the resulting product can be kept in the fridge for up to a week. That’s so funny the commenter below wanted to try coconut milk as well. I will definitely try out the sweetened condensed coconut milk when I make these. Thank you for the link! You’re welcome. I think I’ll try it myself! Let me know how it works out. Thanks for this recipe. Could we substitute few ingredients with some healthier ones? Any other ideas or change in measurements? As for the corn syrup replacement, you could try honey or agave nectar. Hope that helps! Thank you so much! This has made my weekend!